The Mahogany Bar Mission, part of the East London Wesleyan Methodist Mission, was opened on 5th February 1888 and described at the opening ceremony as ‘Methodism’s finest hall’. Situated between Cable Street and St Katharine’s Dock and serving one of the poorest neighbourhoods of late nineteenth-century London, it was housed in the former Wilton’s Music Hall building(1859-1880), one of the grandest of first generation pub music halls. 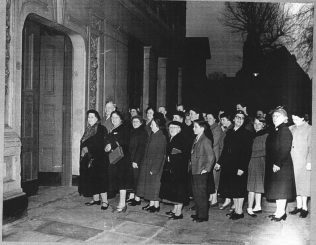 The Methodists named their new mission after the music hall bar because they saw alcohol as the main cause of the East End’s social ills and were proclaiming their arrival as a triumph of good over evil. John Wilton’s 1859 hall was well-designed and well-constructed, with excellent acoustics, and during the Methodists’ seventy-year residency, the mid-Victorian hall and its 18th-century frontage were hardly altered at all, leaving us today a unique surviving example of an early grand music hall which also became a Methodist Mission. The Methodists ran The Mahogany Bar for nearly seventy years. 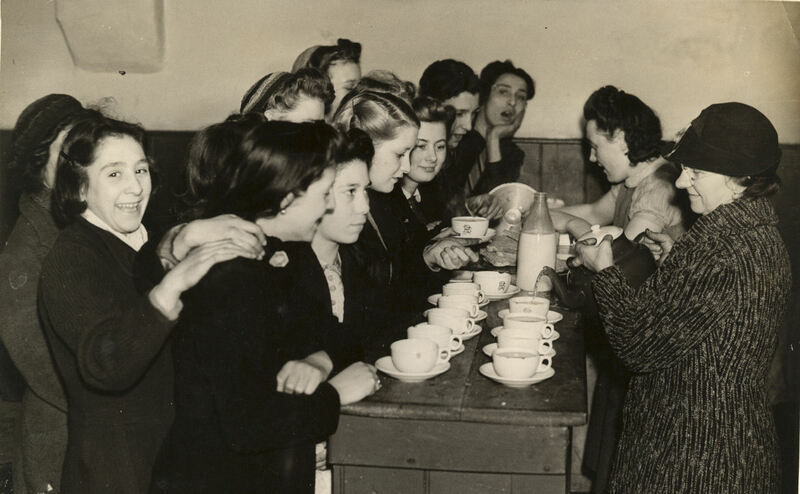 As well as holding religious services and spreading the Christian message, the mission was actively involved in improving living conditions in the East End, most notably during the 1889 London Docks Strike when over a thousand meals a day were served to the starving dockers’ families at the Mahogany Bar. The mission also set up a whole network of social service, distributing food and second-hand clothes, running clubs and country outings and providing free medical assistance before the start of the National Health Service. 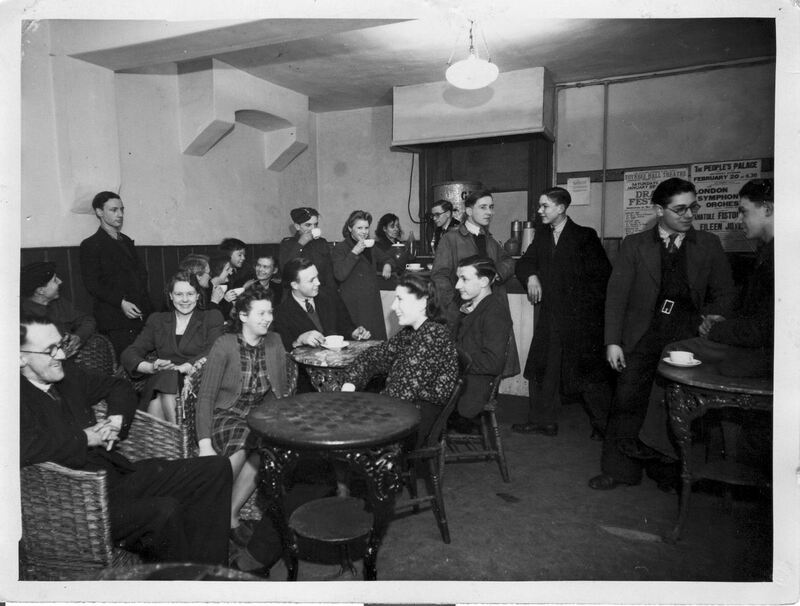 The Mahogany Bar Mission closed in 1956 as the local community had become smaller in the aftermath of wartime bombing and the decline of the docks. The building was then used as a rag warehouse and after decades of dereliction, re-opened as a theatre in 1997. The first image shows Wilton’s and The Mahogany Bar frontage today. The picture from the early 50s includes: Sister Ollington (in uniform and glasses front row, fourth from the right of the picture), William Frederick Waldman b.1891 (second from the left), his sister Roseanna Waldman (just visible in the middle with glasses) and Katharine (Kit) Scorer also in the middle, to the right of Roseanna Waldman (in a lighter coloured coat). 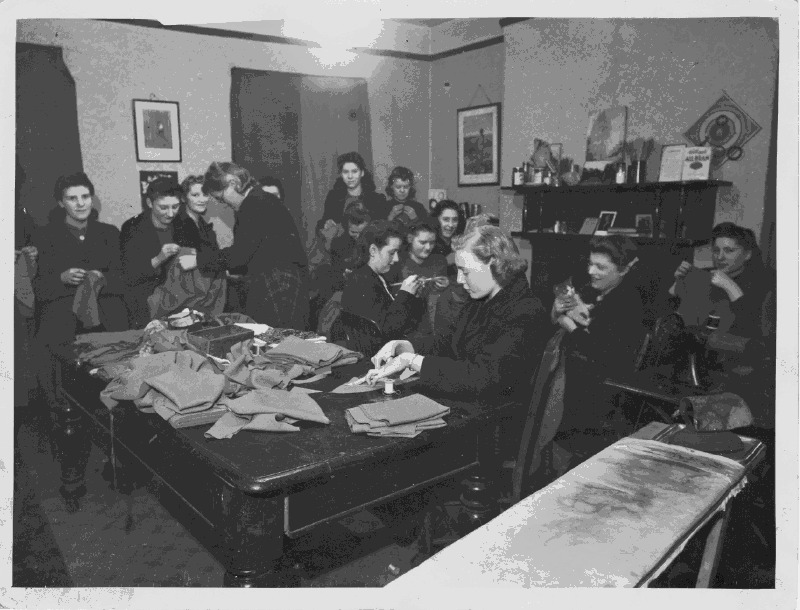 It was sent to us by Betty Lewis, granddaughter of Roseanna Waldman. 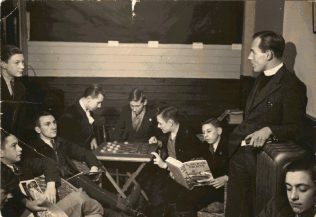 The other five photographs have been donated to Wilton’s archive by Patricia Collins whose father the Reverend Tom Collins was one of the ministers at The Mahogany Bar during the Second World War. The first picture shows Reverend Tom Collins in the Mahogany Bar itself. Patricia’s mother Elsie Collins (née Wahlers) with fair hair, glasses and a plaid skirt, can be seen leading the sewing groups, with her head down cutting material and standing, helping someone with their sewing. Other names written on the back of the pictures (but not so far identified) are Elsie Marsh and Harry Eames. 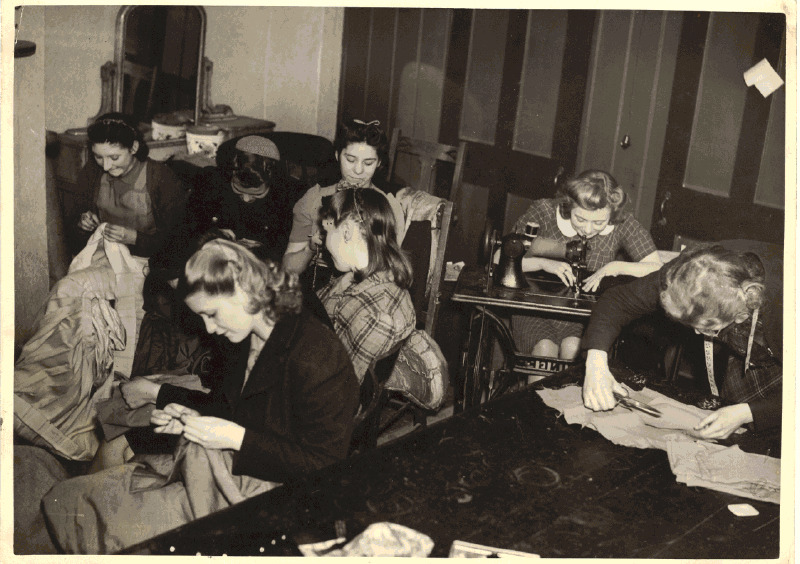 Can you help us identify anyone else in these pictures? 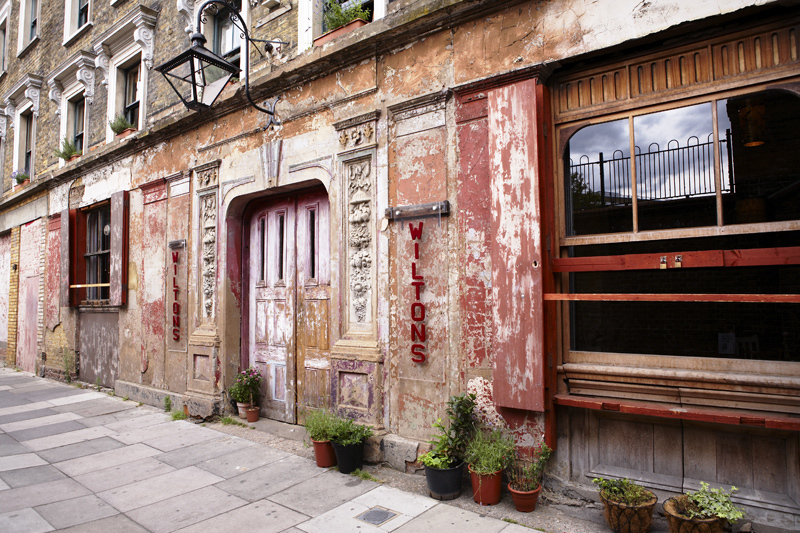 Today Wilton’s is a very successful theatre, concert hall and bar run by a charitable trust. It is also engaged in discovering and celebrating all aspects of its heritage. We’d like to hear from anyone with family history connected with the Mahogany Bar Mission, particularly any information on what was happening in our building during the Battle of Cable Street on 4th October 1936, just round the corner from Wilton’s. Please contact me Carole Zeidman c.zeidman@wiltons.org.uk if you recognise anyone on any of these photographs and visit our website http://www.wiltons.org.uk/ for more information about Wilton’s.